A few weeks ago, I presented a recipe for a rhubarb and strawberry galette. 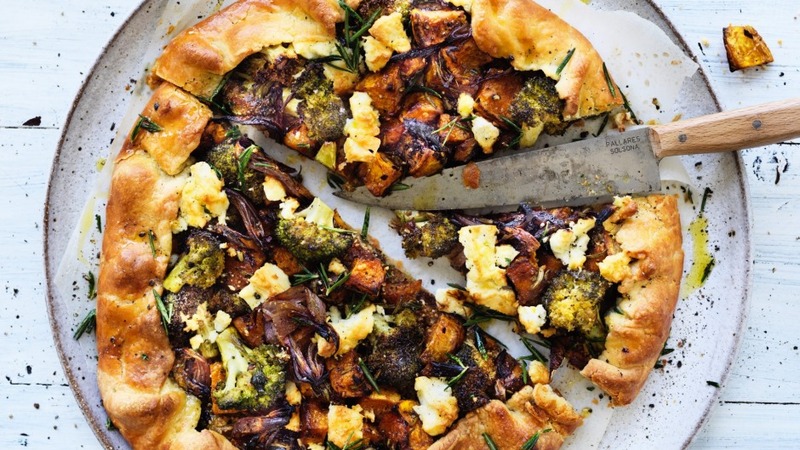 Now that you've seen how easy that is to make, here is a savoury version that uses the same delicious pastry and makes for a lovely autumn brunch. 1. To make the pastry, place the flour, salt and baking powder in a food processor and process for a few seconds to combine. Add the butter and process for another 30 seconds, until the mixture is the consistency of coarse breadcrumbs. Add the cream cheese and pulse to form crumbs, then add the cream and vinegar and pulse again until the dough starts to come together. Tip out onto a lightly floured work surface and press into a ball. Wrap the dough loosely in cling film, and press to flatten into a disc. Place in the fridge for at least 1 hour (it will keep for up to 2 days). 2. To make the filling, preheat the oven to 210C (190C fan-forced). Peel, quarter and de-seed the pumpkin, then cut into 2cm slices. Place in a bowl, add 2 tablespoons of olive oil, 1 teaspoon salt, the rosemary and chilli flakes and toss to combine. Spread out in one layer on a large baking tray and bake for 20 minutes. 3. Meanwhile, using the same bowl, combine the red onion, 1 tablespoon oil, the brown sugar, vinegar, ½ teaspoon salt and ½ teaspoon pepper together. 4. When the pumpkin has had 20 minutes in the oven, add the onion mixture to the same tray and continue to roast. After 5 minutes, toss the romanesco (or broccoli), 1 tablespoon oil, ½ teaspoon salt and ½ tsp black pepper together and add to the tray of roasting vegetables. Stir from time to time until soft and tender, about 15 minutes. Remove from oven and set aside to cool, but leave the oven on at 210C (190C fan-forced). 5. Finely chop half of the hazelnuts (this can be done in a food processor) and combine with the grated parmesan and flour in a small bowl, then set aside. 6. Prepare the baking tray by lining with parchment paper. Remove the dough from the fridge and roll it out on a lightly floured bench into a 40cm circle. Use the rolling pin to carefully roll up the pastry and transfer to the parchment-lined tray. Unroll and sprinkle the nut and parmesan mixture into the centre of the circle, leaving a border about 5cm wide all around. 7. Spread the cooled vegetables over the top of the pastry and crumble the feta cheese all over. Carefully fold the pastry border over the vegetables, leaving the centre exposed, roughly pleating the pastry as you go. Brush the pastry all over with the beaten egg, then bake for about 40 minutes or until the galette is golden brown. 8. Allow the galette to stand for 5 minutes, then cut into wedges and serve. If you like this recipe, try Helen's rhubarb and strawberry galette.